Name Control allows a user typing in their name including prefix, first name, middle name, last name, and suffix. 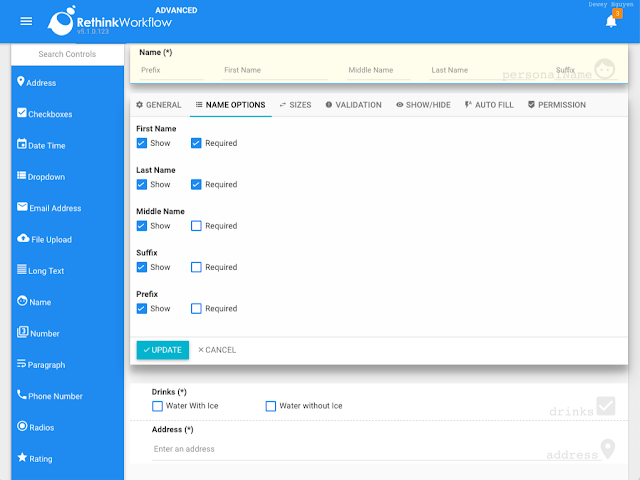 To add Name control to your form, simply drag and drop it from the control panel to the form-design area. To adjust the properties specifically for Name field, click on NAME OPTIONS tab on the properties panel below the control. Option "Required" is to mark the corresponding part of the name is required or optional. The animation below demonstrates how the end-user interacts with a name control. To export the name values, click on EXPORT button and select the desired formats.